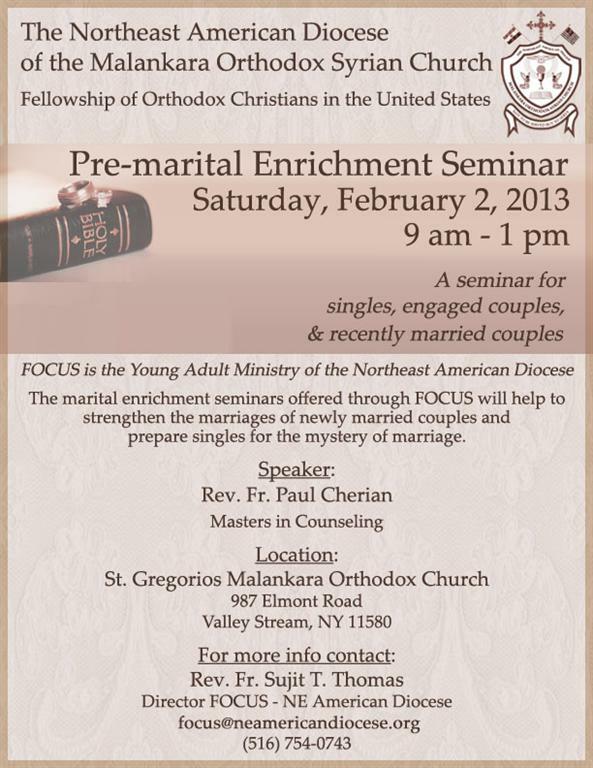 The Northeast American Diocese joyfully announces its Pre-Marital Enrichment Seminar on February 2nd, 2013 from 9AM to 1PM at St. Gregorios Orthodox Church - 987 Elmont Road Valley Stream, NY. This retreat is designed specifically for married, engaged to be married or singles contemplating marriage that seek guidance to improve their marriage in the context of the Orthodox Christian faith. The suggested (but not mandatory) donation cost of this seminar is $10.00 per person, which includes meals, materials, and even babysitting during lecture times. If you are planning to attend, but have not registered yet, please notify at the following email address so that we may make the necessary arrangements: stthomas8@yahoo.com.